This should be a relatively easy ID Challenge compared to previous editions—2 points each for the correct order, family, genus, species, and subspecies. Additional points will be awarded on a discretionary basis for relevant natural history comments. Standard challenge rules apply, including moderated comments during the challenge period (you don’t have to be first to score points), early-bird points to those who do arrive at the correct answer before others, etc. Ben Coulter maintains a commanding lead in BitB Challenge Session #4, but with this and one more challenges left in the current session is his lead secure? This entry was posted in [No taxon] and tagged entomology, ID challenge, insects, nature, quiz, science. Bookmark the permalink. Coleoptera, Carabidae, Cicindela formosa gibsoni Brown. Not normally being given to fits of jealousy I, none the less, hate you a little bit right now. Hope you had fun at Maybell, I’ve always wanted to visit that spot. Well, to start with, the easy points: Order Coleoptera; Family Carabidae; Genus Cicindela. As for species and subspecies: Looking at your post from a couple of days ago, I see one of the items on your wish list was the “red, white and blue” Cicindela scutellaris yampae, and this picture sure looks red, white, and blue to me. Checking the pictures of that subspecies on BugGuide, it looks pretty close, so I’ll go with that one. Oh, and the sand looks to be mostly rounded quartz, a bit fine (~0.5 mm grains), with the occasional black pieces probably being one of a few dozen of the dark, iron- or manganese-rich minerals. Maybe magnetite, hematite, or ilmenite. Good down to Cicindela, but the species is wrong. I don’t know about the geological information, but it sounds good so I’ll give you a bonus point for that. Hi Tracy – ID is correct, plus 5 early bird pts and a bonus point for good deductive reasoning about the location. Italics are easy – type “<i>” (without the quotes) at the beginning of the word and “</i>” at the end. Brown described the Cicindela formosa with greatly expanded maculations occurring in the Great Sand Hills of Saskatchewan as subspecies gibsoni in 1940. This trinomial has subsequently also been applied to similar beetles from dune fields in northwestern Colorado, although current thinking is that the two populations are convergent, and derived from the normally colored local beetles, so the name would not be correctly applied to the Colorado beetles. The only appreciable external difference is in the color of the head of the larva (Pearson, Knisley, and Kazilek 2006). Full disclosure: It’s probably not identifiable to locality based on this photo, but Ted heralded its emergence on Facebook a while back. It’s one of the Moffat County, Colorado beetles. I suppose this should disqualify me from points. A fully correct ID (and I expect nothing less from you now). Also, 4 early bird pts, and 2 bonus points for the very nice summary of taxonomic quadry surrounding this beetle. Your reasoning about the source of the photo is sound, but this individual was wild caught in Moffat County rather than being one of the individuals that I reared from larva. Looks like Cicindela limbata nympha, which, in Alberta, is the southern race of the species, the northern hyperborea race being mostly brown. I have seen these once in the Opal Natural Area north of Edmonton, but I have not managed to get photographs yet. According to Acorn, they like sandy areas and blowouts, far from water. Oops—Cicindela yes, but not nympha (lucky me if I ever get the chance to go that far north). Also, “implied” taxa (in this case, “Coleoptera” and “Carabidae/Cicindelidae” get only half credit. Sorry! 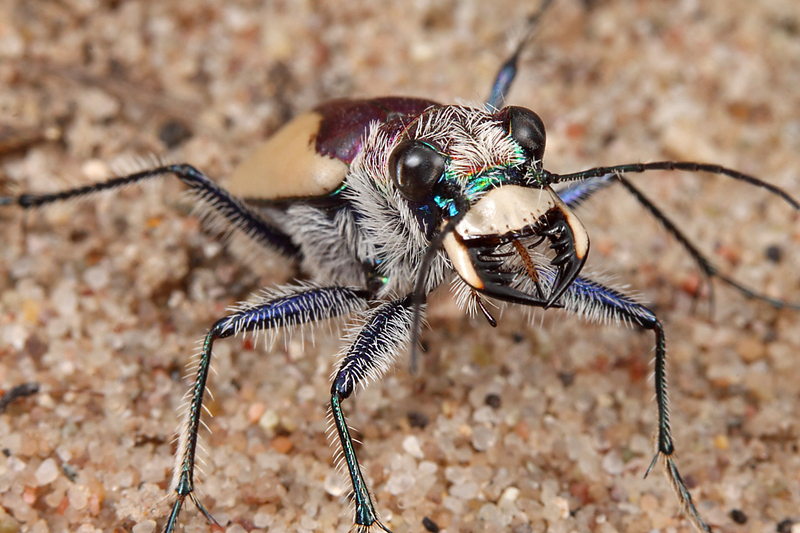 I’ve never seen such a hairy tiger beetle! I think this guy is probably Cicindela formosa gibsoni. I’m basing my ID on the profusion of setae on his face and metallic blue legs, the large maculations that appear to leave only a small, v-shaped patch of red, and the fact that you were heading on a tiger beetle trip in search of this species. According to Colorado State University, this subspecies is found only in Moffat County, Co., often alongside Cicindela scutellaris yampae, another species you were looking for, in sandy habitiats with little vegetation. A correct ID, 3 early bird pts, and 2 bonus pts for the excellent summary distinguishing characters. Hi Laurie – correct on the order and family. Unfortunately, Lophyra is an African genus, while this beetle is North American (although it would have been nice to go to Africa to photograph it). Hi George – very good on the ID, and you get 2 early bird pts as well. I’ll give you a pass on the italicization—this time, since your comment shows you know about it’s necessity. For future reference, Italics are easily done by typing “<i>” (without the quotes) at the beginning of the word and “</i>” at the end. Let’s go with Coleoptera: Cicindelidae: Cicindelinae: Cicindela albissima, the coral pink dunes tiger beetle. Hope you find them on your trip. Hi Bill, good job on the ID, and an early bird pt as well. I do have to deduct a point for not italicizing the genus/species (sorry, it’s a rule–type “<i>” (without the quotes) at the beginning of the word and “</i>” at the end). Thanks for the tip. I didn’t know if I could use html code or not. Now I know, and knowing is half the battle, as they say. This species is found over most of Missouri. Hi Jon, good ID down to species, but the subspecies is wrong. Sorry, but I have to deduct a point for not using italics for the genus name (type “<i>” (without the quotes) at the beginning of the word and “</i>” at the end). but I don’t know about the subspecies…lovely picture – the angle of the mandibles is great! p.s. – i’ve linked to your blog on my new blog because I truly enjoy reading all your posts!